When we’re postgraduates many of us welcome the opportunity to teach. It breaks the isolation of our research and can help us feel part of our department and the community of educators. It helps us to feel we’re making practical use of our long years of studying and that we have an opportunity to make a difference. It helps us to see if we might be suited to an academic career in which teaching forms an important part of day-to-day activity. And, of course, it gives our CV added credibility. But beginning to teach can also be a daunting experience. It can feel like being thrown in at the deep end. There is often only rudimentary training, which sometimes comes too late; very little or intermittent mentoring or practical support; and an identity crisis as one moves from student to teacher but without the status of a permanent position. The first experiences of teaching can be very unsettling. At 3.30 am our demons prod us awake, insisting we think about all the ways things might go wrong and encouraging us to judge ourselves. Do I know enough? Will I have the necessary authority? What if they don’t like me? Will I freeze in front of the group? Will my seminar just be a series of awkward silences? What if the students won’t co-operate? What if they stop turning up? I’m not familiar with the room. Will the layout work for me? Will the technology work, and what if it doesn’t? I’ve never marked an essay before, what if I give it the wrong mark? A thousand fears arise together out of nowhere. We anticipate trouble; think back in horror about poor lecturers we had. There are many practical ways to assuage the inevitable fears. 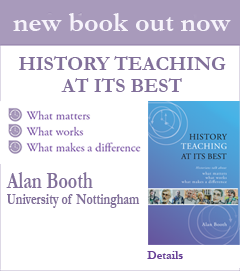 In the film clips featured in www.historiansonteaching.tv and the book History Teaching at its best, experienced lecturers offer their advice on a wide range of issues from planning to structuring classes to classroom layout and exercises that helped them cope. Here are a few things learned from my own (still vividly remembered) experience when I began to teach as an inexperienced postgraduate student who had (stupidly?) agreed to take over the load of a lecturer at a local higher education college on long-term sick leave (no training apparently required). First, it’s important to remember that you’re not alone: everyone has feelings of beginner’s nerves and in fact some nerves are an advantage in ensuring you’re alert and attentive. Second, it’s useful to think back to your own experiences as a student and the sort of things that got you involved and excited. True your students are not you, but there are many things that you have in common. The third, and perhaps most important, thing is to be open to students – and stay so even in the face of the inevitable difficulties and disappointments (after all some classes will be better than others for no discernible reason). It’s easy to dominate proceedings yourself by answering your own questions in seminars or giving a mini-lecture; to close down questions or pretend to be the lecturer you think you should be. It’s all too easy to become rigid in an effort to appear authoritative and to judge them as quickly (and severely) as you judge yourself. But in the long run it’s far better to ask students about their views (on what they want to do, know and need to know etc. ); to admit it if you don’t know the answer to something but offer to find out (or ask them to) and report back in the next class; to check out with them how things are going at a couple of points in the semester; to show your personality. It feels dangerous, but it really pays off. ‘In teaching you can never be perfect. To try to be is a recipe for disappointment and despair. Be realistic – but also be idealistic’. Teaching is a challenge and the deep end can be a scary place to be thrown into, but the challenges are always interesting and the unknown is an exciting place to explore, in teaching as in research. And, one final thing: if you can find others to share your trials and successes with, that really helps. Talking about teaching is a powerful means of putting those pre-dawn demons in their place.